Lionel Mighty Sound of Steam Whistle Distortion? Side note - anyone know the LAST engine to use the MSoS? I believe it's the LTI 18004 Reading 4-6-2 from 1989 ( which I actually just bought yesterday, after wanting it for so many years) but I'm not 100% certain on this. It won't improve. You can put a modern sound card into it, that will improve the sound. I located a circuit board kit at 3rd rail to replace the old circuit board. The manual indicates the installation of a 9v battery to power it. Can I substitute a BCR for the battery? How about being more specific as to what you have. circuit board kit at 3rd rail doesn't really tell me much. If they are specifying an alkaline battery, then a standard BCR won't work. 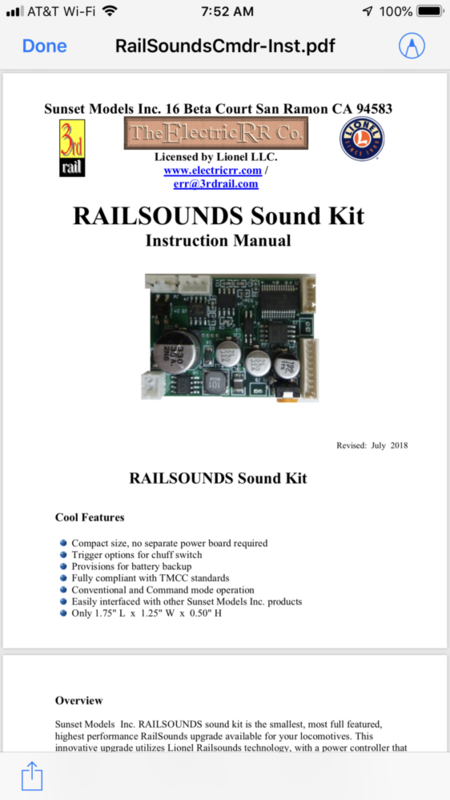 If the battery is only for backup for reversing and poor track connections, you could use my YLB - RailSounds Battery Replacement to replace the alkaline battery. It has the charging circuit as part of the product. Oh, this is the standard ERR RailSounds Commander! Yes, my YLB was specifically designed to replace the alkaline battery for these units. Thanks John! I’ll get in touch once I have the kit ordered.